Max. Data Rate - Up to 3Gbps for each SDI input. System Range - 1000m (more than 3200ft). Fiber Cable - A single multi-mode OM3 fiber optic cable with SC connectors. 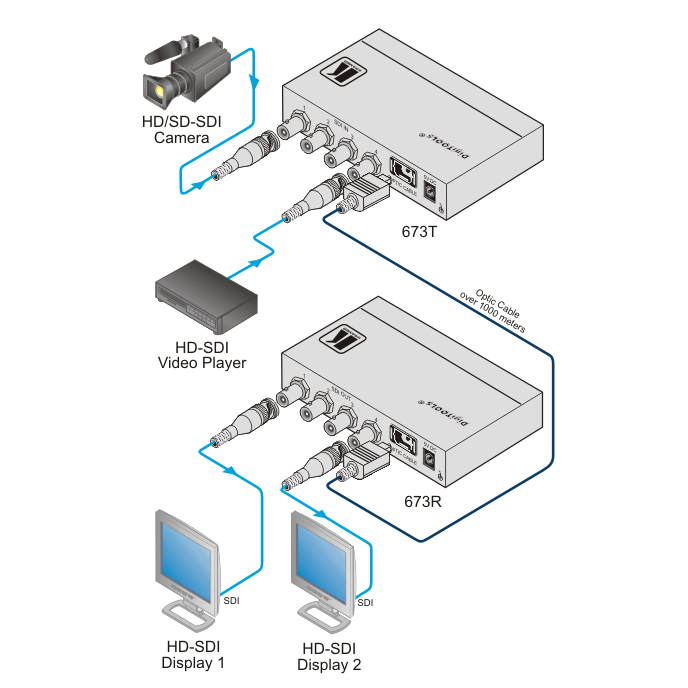 Multi-Standard Operation - SDI (SMPTE 259M), HD-SDI (SMPTE 292M) and 3G HD-SDI (SMPTE 424M) and dual-link HD-SDI (SMPTE 372M). Indicators - Fiber Optic, Source & Input Indication LEDs. Laser Standards Compliance - IEC 60825-1, FDA 21CFR1040; Laser Class 1: Safety of laser products.